Purchase any qualifying NEW boat or ATV from a Bass Pro Shops/Cabela's Boating Center, freestanding Tracker Boating Center, or wherever qualifying brands are carried and receive a 20% discount on Bass Pro Shops ® and Cabela's ® branded merchandise (10% on select, qualified non-Bass Pro Shops or Cabela’s-branded items), and a 10% discount at Bass Pro Shops Signature Restaurants and Cabela's Delis and Grills for up to 2 years! Receive an additional year with valid Military ID. Offer is valid on any new, CURRENT and PRIOR MODEL YEAR boat or ATV of a qualifying brand purchased before December 31, 2019. Some restrictions apply. See your dealer for complete details. * Offer expires December 31, 2019. What are the discount details? 1. Receive up to a 20% discount (10% off purchase of qualified items and 20% off on purchases of Bass Pro Shops and Cabela’s brand items) at any Bass Pro Shops and Cabela’s retail store, and a 10% discount at Bass Pro Shops Signature Restaurants (excluding The Lookout at the Pyramid and Big Cedar Lodge Restaurants) on all food and all non-alcoholic beverages for up to 2 years when you buy any new boat before December 31, 2019. 2. Offer is valid on all new, CURRENT and PRIOR YEAR TRACKER ®, Ranger ®, NITRO ®, Triton ®, SUN TRACKER ®, REGENCY ®, TAHOE ®, MAKO ® and TRACKER ® OFF ROAD purchases. 3. Bass Pro Shops brands include: Johnny Morris, Bob Timberlake, Natural Reflections, RedHead, White River Fly Shop, Walleye Angler, XPS, Bass Pro Shops, Worldwide Sportsman, Offshore Angler, Prowler trolling motors and Ascend. 4. Discounts not valid on the following product categories: non-Bass Pro Shops proprietary reels or trolling motors, electronics, firearms, black powder guns, ammunition, reloading equipment, scopes, bows, arrows, taxidermy, boats, gift cards, safes, fishing and hunting licenses, golf clubs, ATVs, and temporarily marked down items. 5. Discounts not valid at vendor outlets within the store. 6. Discount not valid with any other offers or promotions. Where can I use my VIP discount card? 3. To place your order by phone, call 888-486-8740 (8:00am to 4:30pm CT, Monday–Friday). With a valid email address, 24 months from the date of boat delivery or until 11:59 pm CT on December 31, 2021, whichever comes first. Without a valid email address, 12 months from the date of boat delivery. With valid Military ID, 36 months from the date of boat delivery or until 11:59 pm CT on December 31, 2022, whichever comes first. 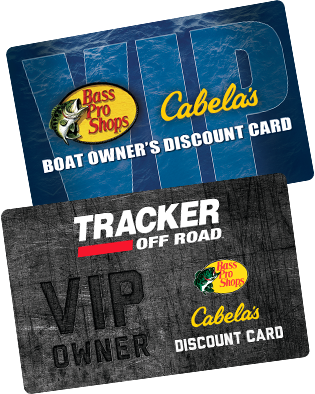 When shopping in a Bass Pro Shops or Cabela's store, do I need to have my VIP discount card with me to get the discount? Yes — You will be asked to present the VIP discount card along with valid photo ID. Can my order ship to someone other than myself when ordering through the Call Center? Yes — But the order must always be purchased with a credit card that is owned by the VIP discount card holder. You will be asked to give them the SRC Code found on the back of your card. I already have a rewards card, does that affect this card? Yes — If you are a Rewards member, provide that card number to the associate. You will be reissued a VIP card in the mail with your existing Rewards account number. This should be received within 10 business days. Can the discount be used in conjunction with other offers or promotions? No — The discount cannot be used with other offers or promotions and is good for eligible merchandise only. Taxes and shipping and handling fees are not eligible. *The VIP Owner's Discount Card offer is available at participating dealers. The offer is valid on all new and prior year TRACKER®, Ranger®, NITRO®, Triton®, SUN TRACKER®, REGENCY®, TAHOE®, MAKO®, and TRACKER® OFF ROAD purchases. See stores or websites for complete brands. Brands offered varies by store. The VIP Owner's Discount Card is valid for 12 months from the date of delivery. Provide a valid email address and your card will be valid for 24 months from the date of delivery. Receive an additional year with valid Military ID. You must present photo ID when using this card. Bass Pro Shops reserves the right to change or modify VIP Member Card program terms at any time. This card is accepted at all Bass Pro Shops and Cabela’s retail store locations and is the property of Bass Pro Outdoor World, LLC. By using this card, the holder agrees to all terms under which it is issued. This card is non-transferable. Cardholder will receive a 10% discount at select Bass Pro Shops Signature Restaurants on all food and non-alcoholic beverages, a 10% discount at Cabela’s restaurants on all food and non-alcoholic beverages, a 10% discount on purchases of qualified items and a 20% discount on purchases of Bass Pro Shops brand items. Bass Pro Shops Signature Restaurants include: Uncle Buck's Fishbowl and Grill, Uncle Buck's Brewery and Steakhouse, Uncle Buck's Grill, Hemingway's Blue Water Café, Islamorada Fish Company, White River Fish House and Blue Fin Lounge. Bass Pro Shops brands include: Johnny Morris®, Bob Timberlake®, Natural Reflections®, RedHead®, White River Fly Shop®, Walleye Angler®, XPS®, Bass Pro Shops®, Worldwide Sportsman®, Offshore Angler®, Prowler® trolling motors and Ascend®. Cabela’s brands include Cabela’s, Alaskan Guide, XPG, Copper River, Meindl, 32 Bridge, Deer Lodge, Herter’s and Rush Creek. Discount is not valid on the following product categories: non-Bass Pro Shops proprietary reels or trolling motors, electronics, firearms, black powder guns, ammunition, reloading equipment, scopes, bows, arrows, taxidermy, boats, gift cards, safes, fishing and hunting licenses, golf clubs, ATVs, and temporarily marked down items. Discount is not valid at Bass Pro Shops Boating Center or other vendor outlets within the store. Any other use constitutes fraud. Discount not valid with any other offers or promotions. Void where prohibited, taxed or restricted by law. Applicable taxes must be paid by bearer. No duplications. Not valid on prior purchases. Redemption is solely the responsibility of Bass Pro Outdoor World, LLC. Not responsible for errors in printing.